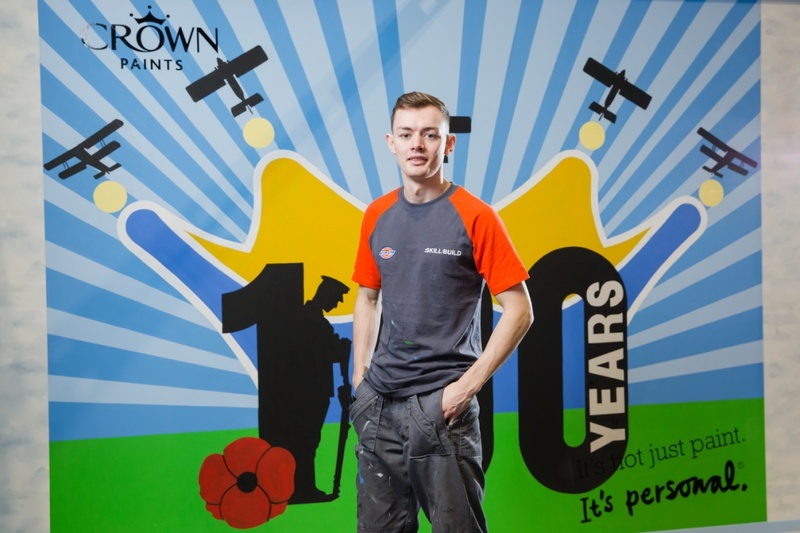 Aiden Dearie has been chosen as the ‘gold’ winner of the 2018 Crown Paints Apprentice Decorator of the Year competition after a gruelling three-day challenge at the WorldSkills UK LIVE event at Birmingham’s NEC. The final pitted seven regional winners against each other as they undertook a timed challenge: completing a design which commemorated the 100 year anniversary of the signing of the Armistice Agreement, marking the end of the First World War. The artwork was devised by Crown’s in-house design studio specially for the competition. Aiden, a 22-year-old apprentice who is completing his SVQ Level 3 Painting and Decorating at City Building Glasgow’s Queenslie Training College demonstrated excellent attention to detail. The judges praised his skill with both matt paint and trim work, and for completing the design well within the timeframe to an exceptionally high standard. He also scored highly in terms of his accuracy and finesse, and for his tidy working area. The annual competition, which is now in its 39th year, is organised by the Construction Industry Training Board (CITB) and sponsored by Crown Paints along with other industry leaders such as British Gypsum. 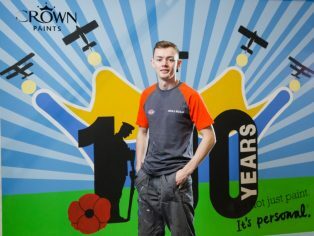 Ben Deer, assistant judge and former Crown Paints Apprentice Decorator of the Year winner, said: “The standard of this year’s competition was incredibly high, which made selecting a winner a challenge in itself. Aiden stood out for his consistency throughout the three days of the competition, and for his tidy and accurate work which achieved a beautiful finish. This year’s silver medallist was 19-year-old Thomas Nowell of Truro and Penwith College, while 19-year-old Bridie Kilby of Leicester College took the bronze. The final was held as part of the SkillBuild event, organised by CITB as part of WorldSkills UK LIVE, at Birmingham’s NEC over three days from 15th to 17th November. It is the largest multi-trade competition in the UK for construction trainees and apprentices and covers a range of skills and sectors from bricklaying and cabinet making to plastering and stonemasonry.